This is a list of all fixed-wing and rotary-wing aircraft operated by the Argentine Air Force since its formation in 1945, and by its predecessor (the Army Aviation Service) since 1912 to 1945. Prototypes and aircraft evaluated but not used operationally are excluded. Aircraft are listed under the main role in which they were used for most of their operational life. For the current inventory see the list of active aircraft of the Argentine Air Force. ^ Ten new single-seat IIIEAs and two two-seat IIIDAs delivered from 1972, seven IIIEA delivered 1980. ^ According to Green & Swanborough (1994) The Complete Book of Fighters, five were built. ^ 35 single-seat Dagger As and four two-seat Dagger Bs, delivered from 1978 to 1982. ^ According to "World Air Forces - Historical Listings", 2 were in service. ^ a b Additional 1981 order of 1 each B.62 and T.64 not delivered. ^ According to "Rumbos Aeronáuticos, Issue 28", 16 were in service. ^ "Rumbos Aeronáuticos, Issue 28" mentions only 1 in service. ^ Lincoln bomber B-003/B-022 was converted to transport. ^ two reconnaissance aircraft delivered each 1978 and 1980. Calibration aircraft delivered in 1981-2. ^ a b c d e f g h i j k l m n o p q r s t u v w x y z aa ab ac ad ae af ag ah ai aj ak al am an ao ap aq ar as at au Ay, Carlos (2013-08-15). "Catálogo Ilustrado de Aeronaves de la Fuerza Aérea Argentina". Gaceta Aeronautica (in Spanish). Retrieved 2014-05-31. ^ Padin 1999, pp. 3-5, 15, 16. ^ Padin 1999, pp. 5-7, 15, 16-22. ^ a b c d e Rumbos Aeronáuticos, Issue 27. ^ "World Air Forces 1981 pg. 40". flightglobal.com. Retrieved 17 March 2013. ^ "World Air Forces 2004". Flightglobal Insight. 2004. Retrieved 17 January 2014. ^ Rivas, Santiago (14 August 2017). "Argentina to receive first Texan IIs in October, buy Bell 412s". IHS Jane's 360. Archived from the original on 14 August 2017. Retrieved 4 December 2017. Amores Oliver, Eduardo Juan (2007). Fuerza Aérea Argentina: Guía de Aeronaves Militares, 1912-2006 (in Spanish). Dirección de Estudios Históricos, Fuerza Aérea Argentina. ISBN 9789872408602. Retrieved 2014-05-17. Burden, Rodney A; Michael I Draper; Douglas A Rough; Colin R Smith; David L Wilton (1986). Falklands - The Air War. London: Arms and Armour Press. ISBN 0-85368-842-7. Bellomo, Sergio; Cordon Aguirre, Arturo; Marino, Atilio; Núñez Padin, Jorge (1999). Núñez Padin, Jorge Felix (ed.). Curtiss Hawk. Serie Fuerza Aérea Argentina (in Spanish). 5. Bahía Blanca, Argentina: Fuerzas Aeronavales. Green, William; Swanborough, Gordon (1994). The Complete Book of Fighters. Godalming, UK: Salamander Books. pp. 175–7. ISBN 1-85833-777-1. BRIEND, Comodoro (R) Roberto (December 10, 2012). "Aviones que equiparon a la Aviación Militar Argentina - Parte I" [Aircraft used by the Argentine Military Aviation – Part I]. Rumbos Aeronáuticos (in Spanish). Cordoba, Argentina: Fuerza Aérea Argentina – Escuela de Aviación Militar (27). Retrieved 2014-07-18. BRIEND, Comodoro (R) Roberto (December 10, 2012). 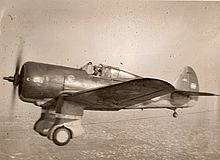 "Aviones que equiparon a la Aviación Militar Argentina - Parte II" [Aircraft used by the Argentine Military Aviation – Part II]. Rumbos Aeronáuticos (in Spanish). Cordoba, Argentina: Fuerza Aérea Argentina – Escuela de Aviación Militar (28). Retrieved 2014-07-18. This page was last edited on 3 April 2019, at 16:37 (UTC).